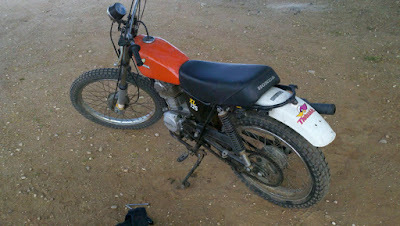 YAW MOMENT RACING: My old 1976 Honda XL125 Lives! My old 1976 Honda XL125 Lives! One of my two best friends from high school, Aaron , gave me this old 1976 Honda XL125 dirt bike back when I was a senior in high school. One of his Dad's friends gave it to him because he couldn't get it to run, then Aaron had no luck, and then I fiddled with it every once in a while without success getting life to the engine. After dragging this Honda to Ohio, then Texas, Ali and I decided to make an art project for her out of it. She was going to clean it up, paint it crazy colors, make a stand, and put it in our house as a decoration...but this never panned out. Finally, I decided to give it to one of my buddies at work who is great at getting old POS's back to life, and he got my old Honda to rumble. He got it running with a hot wheels battery and some other junkyard parts and it now runs like a champ for him. We went out riding at the Twin Buttes Resevoir this weekend and it ran well until he put it down which caused an oil leak around the gear shifter. Once he gets this fixed along with a few other minor issues, this bike should be a great dirt bike for Shawn. I'm just really happy to finally see the thing run.